Most Sought After Colgems Soundtrack? Now that I have been doing this blog for a couple of years, I have found that some monthly uploads get a roar of approval, while others come and go with a complete thud. However, there is one soundtrack that keeps going strong, even though I think few of us have ever seen the movie that it is the soundtrack to. 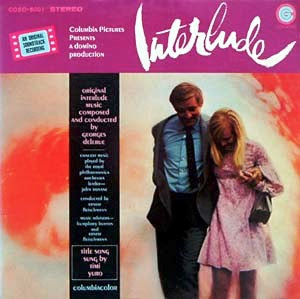 The Interlude soundtrack is one of the rarest records on the Colgems label. The soundtrack is to a 1968 film starring Oskar Werner and Barbara Ferris, and at least in the U.S., the film seemed to have a somewhat short run, even though it generally garnered pretty good reviews. It features both classical and movie pop tunes. I didn't think it would be to everyone's taste, but I was wrong. I get asked about this soundtrack about once a month, mainly from those outside of the U.S., who fondly remember the film. If anyone has any fond memories of the film, please share it with us. I have never seen the movie, but I am getting to the point where I must find this film somewhere to see if, at least for me, the soundtrack merits such attention. 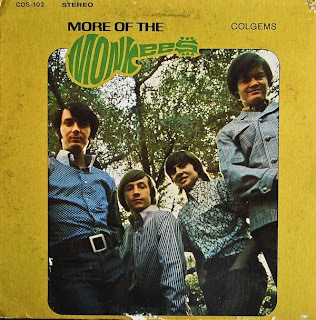 Here is this month's upload, the stereo LP version of their multi-million selling "More of the Monkees" album, the second of their four number one LPs. Again, this version that I have posted came directly from the LP that was released in 1967 and not from any updated CD source. Although pretty much the same as its mono counterpart, I found many of the mixes here to be a little punchier than what was found in mono, including "Your Auntie Grizelda" and "Look Out (Here Comes Tomorrow)." 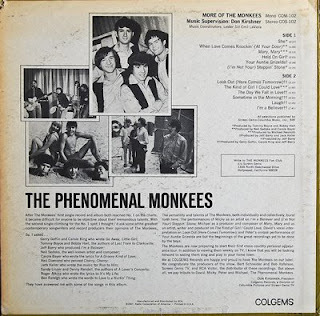 However, I personally prefer the mono mix of "I'm a Believer" and '(I'm Not Your) Steppin' Stone," and since those tunes were definitely mixed with radio airplay in mind, it doesn't surprise me one bit that the mono mix is, at least in my mind, far superior than the stereo mix, even if the 45 mix is the one that got the airplay. Again, the Monkees were at their height of popularity when this came out, but troubled waters loomed ahead. The Monkees wanted more control of their music, and wanted it at all costs, no matter who was put out to dry by their insistence on their own creativity. This insistence was soon to lead to a bit of chaos, but what came forth was one of their better--if not their best work--during their relatively brief existence.